This CellML model description is currently incomplete. In order to fully describe the original model it would be necessary to create 6 different compartments and then decribe the diffusion of calcium between these. Further there are other parameter values which are missing. ABSTRACT: We constructed a chromaffin cell model for analysis of stimulation-secretion coupling in computer simulation studies. The model includes mechanisms involved in the excitatory synapse, voltage-dependent Na(+), K(+) and Ca(2+) channels, Ca(2+)-activated K(+) channels (SK type), buffered Ca(2+) diffusion, Ca(2+) extrusion, fluorescent Ca(2+) indicators and Ca(2+)-triggered exocytosis. Calculations of the modeled mechanisms were carried out using the NEURON simulation environment (Hines and Carnevale, Neural Computation 9:1179-1209, 1997). A set of parameter values was determined so as to fit basic experimental results reported in the literature. The model was also applied to simulate our experimental results obtained from chromaffin cells in the perfused rat adrenal medulla. Observed profiles of Ca(2+)responses induced by electrically stimulating the splanchnic nerve with various frequencies (1-50 Hz) were adequately simulated with minor readjustments of parameter values for Ca(2+)influx and extrusion. Secretory responses measured at the same time as the Ca(2+)responses were also simulated with consideration of a time constant to detect catecholamines in the experiment. Similarly, model simulations reproduced both Ca(2+)responses and secretory responses evoked by elevations of the extracellular K(+) concentration for different periods. The results suggest that the presented model provides a useful tool for analyzing and predicting quantitative relations in various events occurring in stimulation-secretion coupling in chromaffin cells. 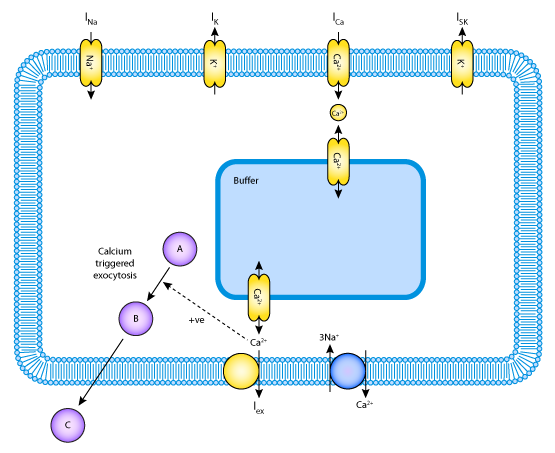 The model chromaffin cell includes mechanisms involved in the excitatory synapse, Hodgkin-Huxley type Na+ and K+ channels, volatage-dependent Ca2+ channels, Ca2+-dependent K+ channels, Ca2+ extrusion, buffered diffusion of intracellular Ca2+, Ca2+ indication with a fluorescent dye, and Ca2+-triggered secretion. Derived from workspace Warashina, Ogura, 2004 at changeset 17f4aef262d8.